SYRACUSE, N.Y. - A retired professor and his wife have made a $370,000 gift to the SUNY College of Environmental Science and Forestry (ESF) - the largest gift ever given to the college's primary fund-raising arm. The bulk of the gift from John B. Simeone and his wife, Henrietta, will fund a fellowship for a graduate student in entomology, the same field to which John Simeone dedicated his 35-year teaching career. "We've been in the Syracuse area for 51 years and we always felt that we would like to do something for the college. We wanted to be able to see some young people benefit from our action," John Simeone said. "There has been a steady continuum of people from this college who have made good careers in forest entomology. They've contributed to public and private institutions and they've become very prominent. They're all over the world. We would like to ensure that opportunity continues in perpetuity." The donation came in two parts. 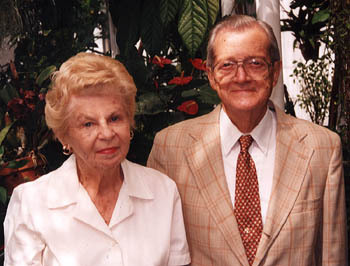 An immediate gift of $220,000 will fund the John and Henrietta Simeone Endowed Fellowship. The second part is a planned gift of $150,000 that is currently funding an annuity that will supply the Simeones with income for life. The principal will eventually be turned over to the ESF College Foundation, the college's main fund-raising tool. "Dr. Simeone's contributions to ESF are longstanding and continuous. He was a dedicated teacher and researcher. He and his colleagues brought notoriety to ESF as the originators of the field of chemical ecology," college president Ross S. Whaley said. "Now Dr. and Mrs. Simeone continue this legacy through a generous contribution that will ensure a future population of students will be able to continue the work he started." Dr. Neil H. Ringler, chair of the Faculty of Environmental and Forest Biology, which includes the entomology program, said the field is attracting a growing number of students. There are about 15 graduate students in ESF's entomology program. Many of them work in the area of chemical ecology, which focuses on the way insects communicate using pheromones. Dr. Stephen A. Teale, who heads the program, said most of the students focus their studies on three pests that have the potential to cause widespread damage to forests. They are the Asian long-horned beetle, a wood-boring insect that kills hardwood trees; the pine-shoot beetle, which damages pine trees; and the pine false webworm, which is damaging white pine stands, particularly in St. Lawrence and Franklin counties in northern New York. "This will be a wonderful opportunity for us," Ringler said. "John Simeone did some important work with wood decomposition insects and this will be a great legacy." John Simeone had a long career at ESF. He came to the college in 1948 and was named chair of the department of forest entomology in 1962. He became chair of the Faculty of Environmental and Forest Biology in 1977. His research centered on wood-deteriorating insects, the effect of temperature and moisture on insect activity, and the chemical ecology of bark beetles associated with the American elm tree. He retired from full-time academic duties in 1983. Simeone and ESF colleague Robert M. Silverstein co-founded the International Society of Chemical Ecology and the Journal of Chemical Ecology, an international publication that is the leader in the subject of chemical interaction among organisms. Simeone holds a bachelor's degree from the University of Rhode Island, a master's from the Yale University School of Forestry, and a doctorate from Cornell University. Henrietta Simeone received her bachelor's degree from the College of New Rochelle and her master's degree in library science from Syracuse University. She had a long career teaching languages and library science at several high schools and colleges.